Welcome to Memory Lane Friday, a weekly blog carnival where you can blog about your memories and link up. All are encouraged to hop in. This week's topic is 5th grade. 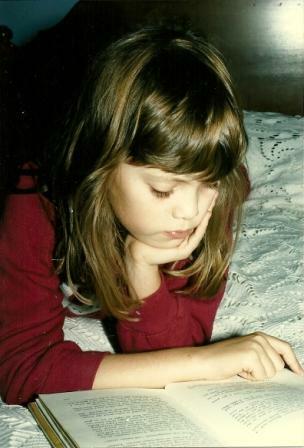 I've always loved to read. I can't remember a time that I haven't turned to books as a form of stress relief, an escape from the real world. I've read so many books I couldn't even possibly pick a favorite. When I was in 5th grade, I got strep throat. I was in bed feverish, and had run out of library books. I needed something to read! And so it was I stumbled upon my grandfather's copy of Gone with the Wind. Thick blue hard back, with gold leaf designs, and a built in blue ribbon book mark. It was a pretty book, and over 1000 pages long. I'd heard about Gone with the Wind, although I'd never seen the movie. As famous as it was, it simply must be a decent read. So I settled in, my throat on fire, sweat dripping down my head. And I was transported to the past. To plantations and gowns in the South. And do you know I forgot all about how lousy I felt? I stayed in that bed reading for two or three days. I only got up to use the bathroom or get something to drink. As you know, Gone with the Wind is one hefty read. For some reason, I totally took to it though. Want to join in on Memory Lane Friday? Just add your link to the linky below. Then please go visit the blogs of others and leave them a comment! Come back next week - it's a no theme week! wow, Gone With The Wind in 5th grade!?! Pretty amazing! Books can be your best friends!! I'm the same way. For many years, I read a book a day and the books literally ran us out of the apartment. I belonged to about a dozen book clubs, too. I never tackled Gone With The Wind, though. You were an extremely smart child to take on that big book!! I know the Kindles are really cool, but nothing replaces browsing through a book store looking through all the books, even the smell is overpowering to me! I am so glad this post got to up! I love it when I find a book I can't put down. That's fantastic! I love how a good book can transport its reader to a faraway place. And Gone with the Wind did a great job of taking your mind away from your discomfort! My oldest is in 4th grade and he just loves to read too. This is awesome, lisa. SO fantastic. I love it! Readers are such interesting people!